Founded in 2013, Jewels of Jaipur is a boutique jewelry company that sources, designs and distributes unique and one-of-a-kind jewelry through regional trade shows and our website. A broad selection, featuring pieces created by artisan jewelers in the fashion jewelry category (gold-plated with semi-precious stones) and a couture collection (gold and silver with diamonds and precious stones) is available both to the trade and to retail customers. Founder, Pat Ryan, travels regularly to India to ferret out these stunning, imaginative pieces of wearable art. Jewels of Jaipur has quickly earned accolades from designers and retailers in key markets including Atlanta, Dallas, Las Vegas, Los Angeles, New York, and Seattle. Pat’s passion for fine art and world travel have inspired her 25 year career in buying and sales management of jewelry and fashion apparel. Her trademark as a buyer has always been her ability to discover beautiful, truly unique pieces from around the world. This talent is complemented by her sales management background and appreciation for customers’ preferences. This past year, instincts led her to the Grand Bazaar in Istanbul and then to India, in search of inspiration for a jewelry collection. 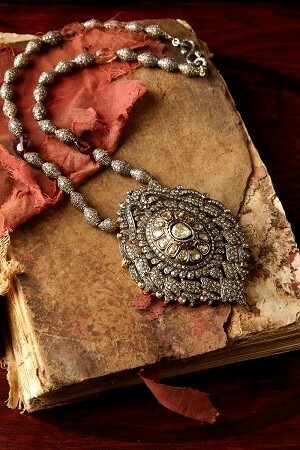 From this experience, Jewels of Jaipur was born and India became her muse. She is attracted to the rich heritage of the region, the colorful and expressive tradition of adornment, the amazing quality of gem production and the fascinating artisan community. We welcome inquiries and new additions to our distribution channel. Small boutiques with a “one of a kind assortment” strategy are a perfect match for us. Key items with a unique appeal can be developed for larger chains. Contact us to discuss pricing and opportunities!